I love him. Okay, it may sound weird when I, as male, say something like that. But it's the truth, I love him. It's kind of funny, going by his looks and all one could easily consider him to be THE incarnation of manliness. And many of the parts he usually plays empasize this. Yet, when you look at, for example his press conference about his engagement to a normal OL it clearly shows that this man is certainly not the stereotypical macho he might play on screen sometimes. In fact, I would say he's one of the most versatile actors I've ever seen. His Taira Tomomori in "Yoshitsune" was very impressive (and pretty much the only Taira who had a plan), his performance in "Tokyo Raiders" (one of Shibasaki Kou's first appearances, she has a tiny little part in it) as the bad guy was flawless. "Survive Style", a completely odd character. "Trick" anyone? And then tv dramas like "Kekkon dekinai otoko" or "At Home Dad" where he shows his talent for comedies. Amazing. The latest movie with him I have on my shelves is "Taitei no ken". Shall we call it a jidai geki? Sort of. Abe-san's wielding a HUGE sword in it and his performance is absolutely perfect. He can play anything and everything. This guy is just awesome, probably on the top of the top of japanese acting, i watched hime in Dragon Zakura, Shiroi Haru, Dekichatta Kekkon and Kekkon Dekinai Otoko, and all these doramas(specialy the later one) totally prove my point. He can play the funny guy(Dekichatta Kekkon), the serious guy(Dragon Zakura, Shiroi Haru) or both(Kekkon Dekinai Otoko). Can�Lt wait to see him in more lead roles with these weird characters lol. Kekkon Dekinai Otoko - groundbreaking best role so far! Await in anticipation his next dorama role... Dontokoi! He is the best actor in the world,not just in Japan. He is a master of facial expresions, he realy doesnt need to speek to say something.He should be a legend and a model for every actor,actress.No matter what character he is playing he makes it so convincing you fall under the impresion he is like that himself.Theres no word that can describe him. He's just the funniest actor around! It's like every drama you watch, you buy, or you see on TV, it's surprising how he just pops up into the screen and you realize he's part of the cast! Although he's always there for comic relief, he also proved to be capable of some serious roles. The best Abe Hiroshi character though would be Kage in Antique! KAGEN!!!!! He was Hilarious. If only some of the actors knoew of this site what great things we say about them!!! He was simply great in Antique cake!!! I liked that show very much and I liked when Kagen would appear and give weird stares... he was wonderful!!! See some of his work if you didn't he's good in Hero too! He's got a gift for physical comedy, but also can play serious roles as well. His supporting roles are as memorable as his leading ones. 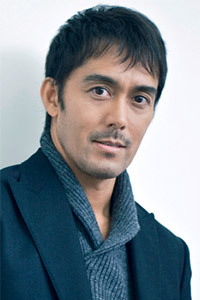 He's great in Dekichatta Kekkon, the Wedding Planner, Antique and Trick. Also check him out in Egao no Hosoku and Narita Rikon for some good performances. this actor is very diverse yet he is cool no matter what role he plays. you rock dude! btw, i dont know if anyone will agree, but this guy seem like he can play Zenigata from Lupin the 3rd. after seeing him play Ueda Jiro and Mineshima, put em together and thats Zenigata. abe-san saikou! I'm only 14 but i respect the more "MATURE" actors of jdoramas. Sorimachi Takashi, Kimura Takuya, Fukuyama Masaharu, Fujiki Naohito, but mostly Abe Hiroshi. His acting is brilliant in every detail and evidently, he's still extremely handsome after all these years. His physical comedy and timing are just amazing! Seriously he's could rival anyone in the world in those departments. I really enjoy watching his acting, not because he's an idol, but because he is so talented (and tall)! I hope he's in something again soon! He's one of the best actors in the business! I love how he takes roles of all sizes. His performances always stand out. Also, he's incredibly hot. I love that he looks good with both his smooth and rough look. Even in nerd drag as Ueda Jirou, he looks good. Very funny actor! Excellent in the Trick series and in all his supporting roles like Shotgun Wedding, Yoshitsune, Hero. But his best perfomance has to be in Kekkon Otoko. Oh man, he was hilarious. One of my favorite actors. Too much skill.. He's such an Actor. Saw him in Antique, Wedding Planner and Kekkon Dekinai Otoko, all have proved he can actor in any roles. He's a comedian, yet he can be very cold sometimes, or cry? He's just an outstanding actor and i admire him so much !! he is a really good actor.. can always make me laugh.. seeing him in trick , dragon zakura , kekkon dekinai otoko and change makes me wanna to see all of his acting..im currently watching at home dad and i think he is really GOOD.. The single HOTTEST J-drama actor of them all. This site needs to post a better photo of him, with better hair! Abe-chan must be the hardest working actor in all of Japan. He does what, 4 films, 3 dramas, 5 commercials a year!? My favorite actor in the J dorama world. He's the only reason I sat and watched Antique series. What is there to say...the guy is a great actor good in all kinds of roles. He can do it all. I love him in Trick too of course. I think in almost all of his dorama, he's always been described as the "tall man", espescialy in Trick. He's one of the actor that have charisma and acting skill that rarely seen in other actor. Beside that, he's very funny. Quite a unique actor,with very distinct facial features. Something like ken hirai. I think he actored in a Hongkong Movie way back in the 90's called the saga of the phoneix. Where he is a priest with magic powers. When I chance upon a drama and find to my surprise that Abe Hiroshi is in it. It doesn't matter if it is a small or major role, it will always make my day. He is always funny to watch, and very charming. Sadly in Japanese Hollywood, actors that are old can't make it as popular as some. But I definetely believe if he started as early Kimutaku, Kimutaku wouldn't even be able to hold a candle to him. An all-around great actor, he's perfect in every role! He's also one of the very rare "manly" handsome Japanese actors (because most Japanese celebrities are either "beautiful" or "pretty"!). Why i like him? i don't know but every drama lead by him is good. Kekkon Dekinai Otoko, Trick, Dragon Zakura... Coincidence? But i like him best in kekkon dekinai. really fit the role.